In general, Dustin Henderson is an irresistible character— too cute for words is a fitting description. Recently equipped with two rows of sparkling "pearls" (commonly referred to as teeth), he makes the "grrrr" sound as much as possible and it never gets old. In addition to his new pearly whites, Dustin's nurturing heart is another admirable trait that makes us say, "aw." His caring and loving nature toward D'Artagnan, an icky slug-alien from the Upside Down, is endearing and genuine, solidifying Dustin as a loyal and lovable little kid. He even cares about his pet after it's morphed into a snarling, repulsive Demodog. (Yikes!) Last but not least, his perfectly coiled brunette ringlets serves as the cherry on top of his cuteness. Unfortunately, we can't bestow you with a full set of teeth or impart a sense of goodness, but we can hook you up with Dustin's brunette curls, thanks to this Waupaca Stranger Things Dustin wig. You'll be one step closer to achieving Dustin's undeniable cuteness. 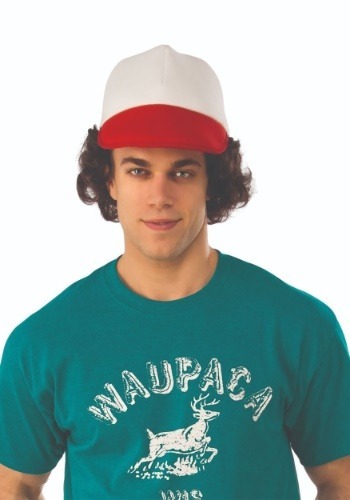 An officially licensed accessory, the white and red trucker hat is attached to a synthetic curly wig. The interior features a stretchy elastic mesh cape, able to expand, fitting all adult-sized heads. Want the complete Dustin Henderson experience? 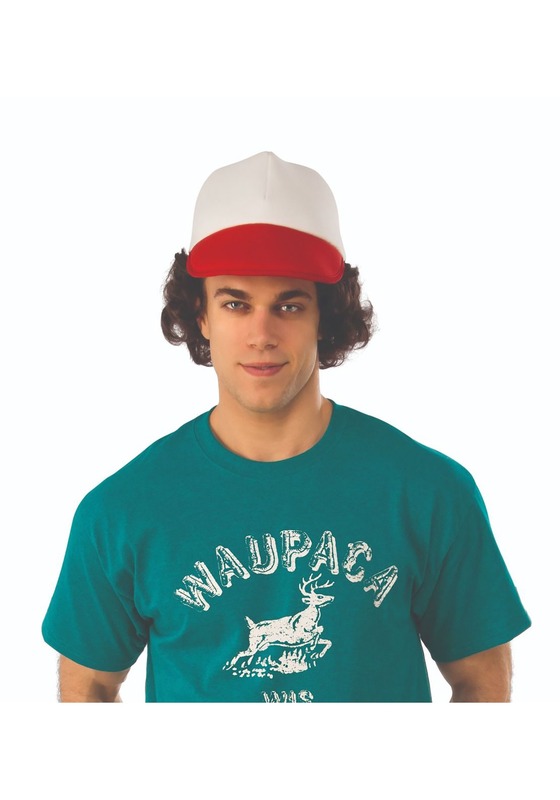 Pick up the officially licensed Stranger Things Waupaca shirt to achieve the exact look pictured here.